This quick weeknight meal is packed with flavor from nutritious vegetables and lean protein. 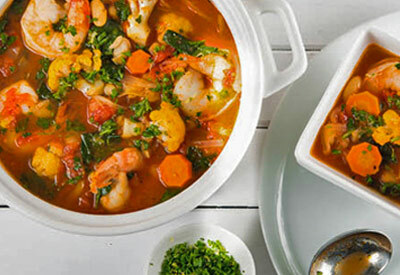 The stew combines pantry staples with fresh ingredients that can be used in other dishes throughout the week to reduce food and packaging waste. Serve with an Earthbound Farm organic salad topped with your favorite dressing and enjoy! Heat oil in a large pot over medium heat. Add onions, carrots and cauliflower; saute until onions are softened, about 5 minutes. Add oregano and thyme, then season veggies with salt and pepper; stir for 2 minutes more. Stir in clam juice, crushed whole peeled tomatoes with juices, and cannellini beans; cover and simmer for 15 minutes until cauliflower is fork tender. Meanwhile, make the citrus herb gremolata by stirring together parsley, lemon zest and salt to taste in a small bowl until combined. Set aside. Uncover the stew, stir in the baby spinach and shrimp. Cover and simmer for 2 to 3 minutes more until shrimp are pink and spinach has wilted. Serve family style or in heated bowls, if desired. Garnish with citrus herb gremolata. Leftover stew can be stored in an airtight container in the refrigerator to enjoy for up to 2 days.